Acuity Market Intelligence Reports that Europe has the Highest National eID Country Adoption Rate, While Asia Dominates the National eID Market in Volume and Revenue Share. 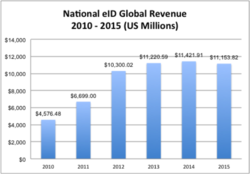 Acuity Market Intelligence today announced that a dramatic shift from traditional National IDs to National Electronic IDs (eIDs) would generate more than $11 billion dollars in annual revenue by 2013. While the total number of countries with some form of National ID program is projected to increase just 11%, growing from 126 to 140 between 2010 and 2015, the number of countries with National eID programs will grow from 67 to 114 over the forecast period, an increase of more than 70%. Europe has both the highest country adoption rates and the highest growth of new National eIDs programs. Of the 43 European nations with populations exceeding 100,000, 77% will have National eID programs by 2015. However, it is Asia, with dual population titans India and China, which dominates National eID credential and revenue market share, exceeding 400 million credentials and $7 billion in revenue annually by 2015. These forecasts and analyses are from "The Global National eID Industry Report”. A report that provides previously unavailable critical data and statistics including National eID credential volumes and revenue forecasts globally, by region, and by country from 2010 to 2015. With the publication of this first of its kind comprehensive overview of the worldwide market for National eID programs, Acuity Market Intelligence confirms its reputation as the leading provider of candid, hype-free, and data-driven insight about the eID marketplace. To order, preview, or get more information on "The Global National eID Industry Report”, contact Acuity at +1 303 449 1897 or info(at)acuity-mi(dot)com, or visit http://www.acuity-mi.com/GNeID_Report.php. Acuity Market Intelligence (http://www.acuity-mi.com) is an emerging technology strategy and research consultancy with a proven record of accurately anticipating biometric and electronic identity market trends. The company provides strategic planning, market research and analysis, sector tracking, opportunity sizing, solution, and deployment analysis, due diligence, executive briefings, and customized consulting. Founded in October 2001, Acuity is headquartered in Millburn, New Jersey, USA with clients in the United States, Asia, and Europe.